for PSpiceÂ® and OrCADÂ® -- Now Version 4.3! 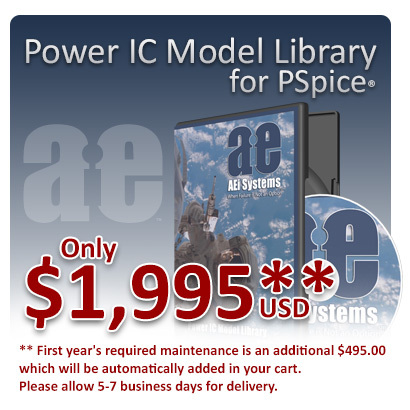 AEi Systems is now selling the Power IC Model Library for US$1995.00**. This product is specially designed for the PSpice analog and mixed signal simulator. The Library has over 550 hyper-accurate cycle-by-cycle transient models that individually cost between $1000 - $14,000 EACH to develop, all in one convenient place. Texas Instruments, International Rectifier, Analog Devices, National Semiconductor, Vishay, Intersil, Power Integrations, Micrel, and ON Semiconductor, are just some of the vendors represented. Pulse Width Modulation (PWM) controllers, Switching Regulators, Multi-phase controllers, PFCs, Integrated switch & boost controllers, hysteretic controllers, IC regulators, and models for other popular parts (FET drivers, opto-couplers, etc.) are included. You can perform high-speed cycle-by-cycle simulation to show true large-signal performance, simulate current-mode control using the latest accurate modeling techniques; run CCM and DCM converter simulations; analyze control systems including loop gain, input filter design, and analysis; and measure power stage loss and perform stress analysis for all major components. In summary, you can simulate your entire power system. Some of the Power IC Model Library for PSpiceâ€™s newly-added models incorporate recent PSpice built-in component and building block advances -- advances that allow models to take full advantage of PSpiceâ€™s capabilities. The new version of PSpice also includes speed increases for simulation of math equations and â€œif-then-elseâ€� constructs that are used throughout the model library. This improvement results in speed increases of 10 to 40% for power supply simulations. SMPS applications today are much more demanding than ever. Today's designs require increases in switching frequency, higher efficiency, and lower standby current. State space based models simply do not reveal many important nonlinear factors that influence these performance characteristics. Nonlinear characteristics such as propagation delay, switching speed, drive capability, maximum duty cycle/current limits, and Startup phenomena are all accurately modeled. You can directly compare the performance of components from different vendors and analyze the effects of different implementations such as peak current mode control, hysteretic current control, low voltage, and low operating current, to name just a few. The models utilize analog behavioral elements and special Boolean logic elements. Together they greatly reduce the modelâ€™s simulation runtime, an important factor in SMPS analysis. Most simulations run in just a few minutes. The library includes example application circuits for most of the IC models. Symbols, libraries, and schematic sets are available for both MicroSim Schematics as well as OrCAD Capture. Power IC Lib Brochure download. Â©AEi Systems, LLC. All Rights Reserved.